I need to start going to more dance productions. My schedule is pretty busy with plays and musicals, and I don't know as much about the world of dance, but whenever I do go to a dance performance I always enjoy it. Such as the show currently playing at the Guthrie Theater's 9th floor Dowling Studio - Swimming with My Mother. Dancer and choreographer David Bolger (who so brilliantly choreographed last summer's blockbuster musical H.M.S. Pinafore at the Guthrie that he won an Ivey Award for it) choreographed this piece and performs it with his 78-year-old mother Madge. It's completely lovely and enchanting, a beautiful, sweet, and touching exploration of the parent-child relationship. David, co-founder of the dance company CoisCéim Dance Theatre (from the Irish word for footstep), originally created this piece for the Dublin Dance Festival in 2010. He was asked to create a solo piece for himself, but instead he chose to bring his "Ma" along. Featuring voiceovers of Madge telling stories about her life - her father teaching her to swim in the Irish sea, and then teaching her children to swim on that same beach - Madge and David express their relationship and their love of swimming and dance (respectively) through movement. At times they appear to be swimming, or underwater; later David convinces his reluctant mother to dance with him to Nat King Cole's "It's Only a Paper Moon:"
There is something magical about swimming, particularly in a natural body of water. I recently spent a week at a small, private lake near Brainerd and spent hours in the water every day. There's something very comforting about swimming in a lake, like you're a part of nature. And swimming is a little like dancing; it's impossible not to be graceful in the water - it slows down your movements and smooths them out. Swimming with My Mother beautifully illustrates this. As someone said on the elevator after the show, "It makes you want to go swimming, doesn't it?" Madge is a lifelong swimmer and swimming teacher, and still swims five days a week. That love of swimming is apparent in the piece, intermingled with her love for her children, and theirs for her. 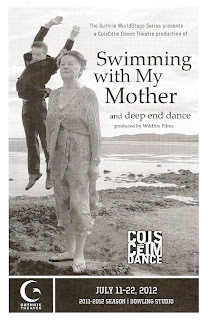 Madge and David Bolger "swimming"
If you're a fan of dance, or swimming, or even if you're not, Swimming with My Mother is worth checking out. The hour-long performance concludes with a screening of David and Madge's 6-minute film Deep End Dance, in which they dance underwater in the very pool where Madge taught David to swim. It's a lovely and beautiful thing to witness.